I showed you the chair I got at a yard sale on Friday while out junkin with Anne from White Lace Cottage. Yep! good bones but mauve fabric not doing much for this old gal she definitely was dating herself with the mauve fabric. I dumped her cushion. I thought she looked better without the old cushion. So with a little help from my blog friends Anne and Nana Diana I took the plunge and decided to paint her with Annie Sloan chalk paint. Ohhhhh paint fabric?!!! Yikes I thought. I have seen this done before and the pieces have come out beautiful but I had never done this. So after talking to Anne and Diana I decided to try it. 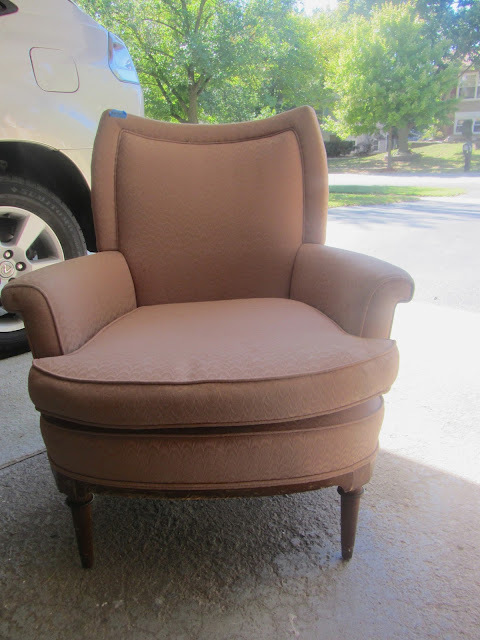 Anne did her chair with three coats of chalk paint and then waxed it. Diana told me she used regular water base paint and sanded in between coats to keep the fabric soft when she painted her furniture. Diana also told me about adding a fabric medium to the chalk paint to help keep the fabric soft so I ran to JoAnn Fabrics and picked up the fabric medium and followed the direction of adding one part medium to 2 parts paint. It covered beautifully and stayed soft. 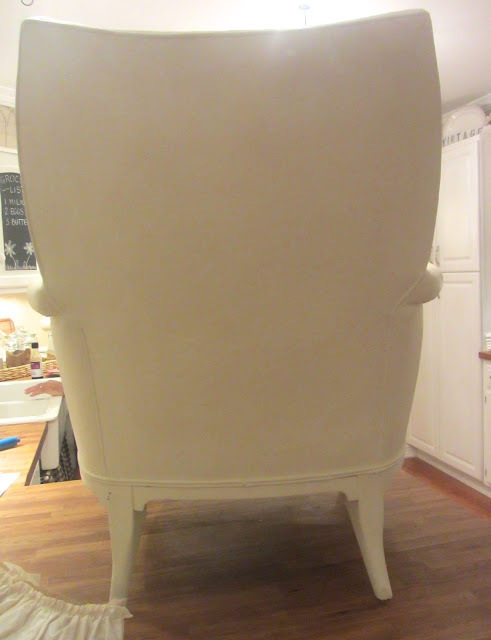 I did three coats of Old White Annie Sloan chalk paint. I did not sand in between but did do a light coat of wax in the end. I loved the way this came out. She had pretty legs but I wanted to dress her up a little bit so I added this ruffle skirt. She needed a pretty skirt. No sew Kris here so I took this ruffle off a drapery panel I had and just attached it. Not too shabby for someone that cannot sew. I love when I can repurpose something I already have. There you have it a new "old" chair. It is amazing what a little paint can do to change the look of an old chair bought at a yard sale. The chair turned out beautifully, Kris! I would be like you and a bit anxious about painting a fabric chair. 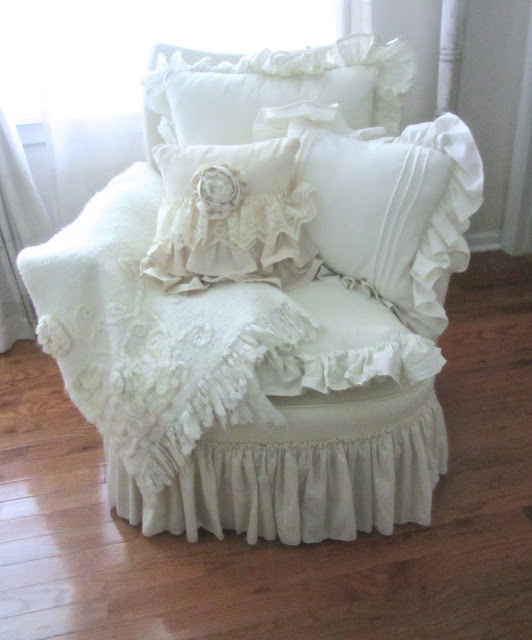 It looks like a totally new chair now and I love the ruffle you added! Perfect!!! what a great transformation, love the new sew ruffle!! I have never heard of painting material... Wowzwers. It looks amazing. What kind of wax did you use? So cute. It was pretty easy. I used the Annie Sloan wax. 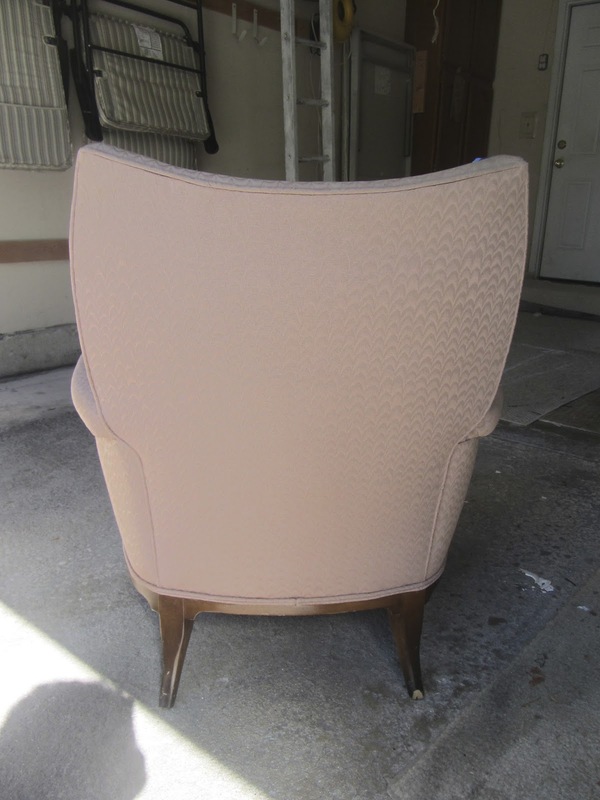 You should try this it is an amazing transformation of upholstered fabric. Pretty amazing transformation, Kris! I love the ruffle on the bottom, and can't believe you found one in just the right length to repurpose. I thought for sure you dusted off your sewing machine to make the ruffle! This is just way too cute, Kris!!! You're becoming quite the DIY! Love it!! I love how your chair turned out. 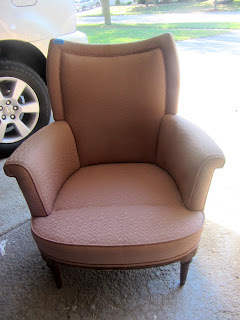 I painted a chair with chalk paint too but did not add the fabric medium. That's a great tip from Diana. Love the ruffle and those pillows....ooh! It does look wonderful though. It is pretty soft with using the paint medium with the chalk paint which is a softer paint too. It does have the feel of a softer leather but really more like fabric feel still too. I think with waxing it and using the medium helped it to not feel like leather too much. This is not a chair that someone would be sitting in a lot so painting it was a perfect solution to changing it up. Have a great week my friend. I LOVE IT! Love it more without the skirt and ruffle pillows, just my preference. Amazing. That is all I can say! Your chair turned out just fabulous Kris! I've seen this done before but have never done it myself. I have an antique settee which was reupholstered in the 1980s and it needs to be redone. I'd love to repaint the fabric since it's in perfect condition. Thanks for the inspiration. Wow ... I never would have thought to paint a chair .... a fabric chair!!! It came out beautiful!!! And the ruffle just added so much to its character. Oh Kris...it turned out beautifully! I love being able to paint furniture especially with the upholstery being in such excellent shape. It certainly cuts down on work and turns out much nicer in my book. I love it!!! I wish I could sew like you I would pick a slipcover over painting furniture any day but since I do not sew this was an option to try. I am glad I did and it came out pretty good for my first try. I continue to be so hesitant about painting fabric, but this looks amazing, Kris. And what do you mean you dumped the cushion? The seat looks like it's got a cushion. It just looks fantastic. How does wax do when you sit on it? Does it stain clothing, do you know? I am so full of questions! I know Rita after I picked up the cushion it was all upholstered underneath too. I love it better without the stinky cushion. Ha Ha it is the nurse in me to not want the cushion that who knows has been on that through the years!!!!! That just shows that a long time ago they made furniture so much nicer than they do now. I was hesitant too about painting fabric but thought I would give it a try on this chair from the yard sale. So far it has come out pretty nice. Hi Kris, The chair turned out fabulous! I would have never thought that the fabric was painted. It looks like it had always been white. The ruffles are a great finishing touch. What a wonderful makeover! I love it!!!! I never would have thought of painting it. it looks great. Looks gréât and oh so inspiring! I wanted to let you know that Jennifer contacted me asking if she could push me to the February issue of artful blogging, she said I was going to be a much better fit for this month, sad that I won't see myself in the up and coming issue, but I surely can tuff it out till February when love is in the air. Thank you my sweet dear friend for taking the time to stop by, a beautiful day to you and a week of inspiration to follow. 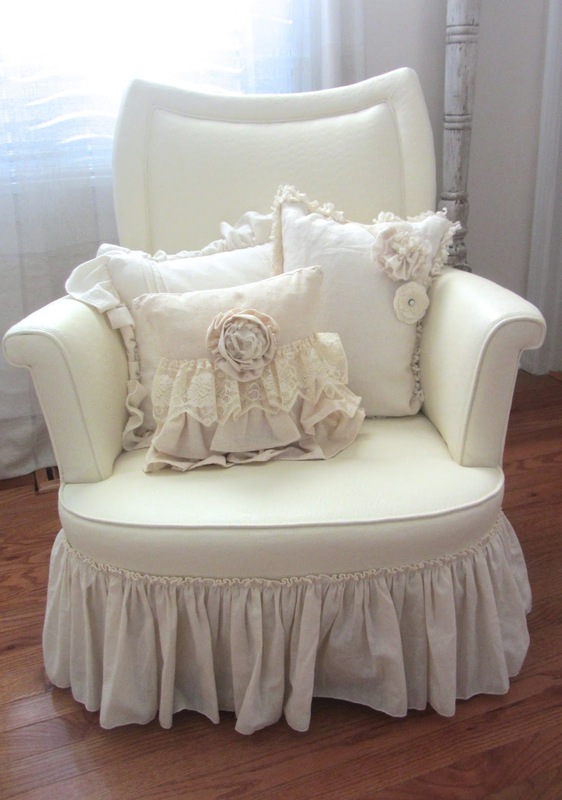 Love the chair with the ruffled skirt! Great job! Wow...amazing! I' ve never heard of painting a fabric chair...it looks gorgeous now! I love your beautiful pillows too. Very, very well done! Wow! Love what you did with that chair! I've never painted an upholstered piece before, but have heard that it works out well. Your chair is proof of that too! Love the ruffle you added. I never would've guessed it came from a curtain panel. What a great idea! I'll have to remember that one since I don't know how to sew ruffles either, but love them. That's the perfect kind of chair for a bedroom. Well that's something new to me. Looks fantastic! How do you keep the fabric from bending and showing the old fabric. This transformation is simply amazing! You were very good and congratulations! Oh my goodness--when I saw that first picture I had no idea that it would turn out so beautiful. Wow--you did an amazing job! OMG I can't believe that you painted the chair and that it would turn out so beautiful. I have a love seat in my bedroom that I don't care for the color fabric - so I am going to try it. You did a fantastic job on the chair. Love the ruffles also and the pillows look great. WOW!!! Who would have guessed that you could do that? I was not expecting such a gorgeous transformation. Wow!!! You have blown my mind . . . this is amazing. Love your yard sale chair! The change from painting the fabric is awesome. You saw the pretty shape and had a vision. Have a great week! Whoooo Hooooo....You did a wonderful job, Kris! I am so proud of you for just jumping in and doing that! It looks amazing...and the ruffle is the perfect finishing touch. Did you glue it on or just wrap it and pin it somehow? I definitely need to get back to painting once again. I haven't painted in the longest time other than spray painting. I got a couple of chairs I should do. Kris...the chair is awesome and looks gorgeous with those pillows!! Love it!! Oh my gosh! How beautiful is this!!! I love this look Kris! So perfect! Shut the front door. You did it, and did that fast Kris. It looks amazing!!!!!!!!!!!!!!!!!! Pinning. she's gorgeous, kris!! it's the ruffled skirt and pillows that complete her outfit so perfectly!--just love it! Hi, sorry if you've already answered this Q but how does the fabric feel after painting? Is it soft and comfortable to sit on? It feels like a soft leather chair would feel. I thnk it is comfortable to sit on. It will not feel like regular fabric anymore. Hope that helps. Girls with vision are awesome! the chair is amazing Kris! I am a little confused though. Did you actually wax the fabric or are you talking about the wood part? Thank you so much for this post! I have a loveseat in the master bedroom that does not go with the décor and I didn't want to spend the money right now to upholster. I was concerned that it would be too stiff but now I know what to use! Have a blessed week! I have read a few posts about painting fabric and it is just so hard to imagine. That chair looks beautiful though! Wowee, what a difference! I have a chair I've been thinking about painting with ASCP and I've been procrastinating out of fear I'm going to destroy it (family heirloom). This gave me the confidence to just dive in and do it. Thanks Kris! I say go for it. Just get the fabric medium to help keep the fabric from getting to leather like or stiff. Then use use the wax at the end lightly and let it dry it will help seal the paint. I just kept telling myself it is just paint!!!! It came out a lot better than I thought it would. Good luck. Kris, she's lovely! You can really see the lines without the distracting color and wood. Great choice! I've painted two pieces of furniture - a French chair cushion and a sofa. One in ASCP and one in latex. I think the ASCP is softer...and I didn't wax mine. WOW! What a change. I have heard about painting fabric, but would not have had the nerve to try it. Did it take long to dry? How does the fabric feel? So many questions. Good job, dear friend. Wow! It turned out Fab! Wow Kris, you have made me a believer with painting furniture with this project. So lovely and that skirt you added is the perfect finishing touch. Also adore the pillow. Wow! I had to do a double take when I read that you actually painted the fabric! That would take alot of courage! Your chair turned out just beautifully, I love her skirt! She looks oh so much happier now with her creamy makeover!! Kris, What a fabulous transformation!! The chair looks fantastic all in white! And those pillows and ruffles everywhere, love it! You've inspired me to use paint now on fabric!! Thanks for always stopping by with your wonderful comments. Love hearing from you! I dragged home a chair someone had painted this past weekend. I thought it was so clever. Here you go painting fabric with a beautiful result. Loved the way you styled it. Now I am wowed! Love the transformation. The chair looks great, but how does it feel? Is it comfy and soft? I'll have to get some tips from Diana about painting fabric. My first try at it was painting an old lampshade with fabric paint and it turned out well. Love the pillows on the chair. Where did you get them? I thought maybe you made them but you said you don't sew. Kris...I cannot believe this is painted fabric! It is absolutely gorgeous! I am all about repurposing just about anything too but i have doe this. You did a fantastic job! Wow that's amazing, painting fabric, I've never tried that. So you added the medium to the chalk paint or applied it directly to the chair? So it won't crack or anything when you sit on it? I'm just really intrigued with this idea. My mind is racing thinking of different pieces I could paint rather than upholster. Thanks for posting this Kris. What a transformation and seriously that is a no sew frill skirt. awesome job! I love it, Kris! Isn't it fantastic that we can salvage old chairs with paint like this? I'm so glad you tried it...it really is easy. Mine have softened up so much. Gorgeous transformation! I love that you added the ruffle - it makes it so much softer. Thankyou for sharing your project! I love, love, love it, Kris...enjoy it in your home! this is amazing, and beautiful! I'm sure there have been a hundred questions asked, so will read through the comments before I ask mine. Here is the info to help you and then if you still have questions just email me. I vacuumed the chair really well. The fabric was in great shape on this chair so I was lucky. Then I went to JoAnn Fabrics and bought a bottle of Fabric Medium that I found by their paints in the bottles. I mixed on part fabric medium with 2 parts of chalk paint in a paint tray. I used a small roller and a paint brush. I just rolled on the paint and used the brush to get in the corners etc. The first coat went on great and it soak in some of the paint not alot but some. I let it dry for about 20 minutes and then put on another coat. The second coat went on great. Then again I waited about 1/2 hour and put the third coat on then let it dry overnight. Then I used the annie sloan wax for the chalk paint and put a light coat of wax on the chair to seal the chalk paint. Now if you use a reg. latex water base paint you do not have to wax it. I would still suggest using the fabric medium in with the latex paint too. Pretty easy. The fabric medium just helps to keep the fabric from getting stiff with the paint. Some people have used it and some do not. One blogger used reg. paint and just sanded lightly in between coats of paint and she said it kept the fabric soft. My chair feels like a soft leather but still has the appearance of fabric. It is amazing what you can learn to do in Blog Land!!!!! Good luck have fun with this. So, you have me looking for a chair to paint! This is amazing!! The fabric isn't "crunchy" when you sit in it?? Wow. YOu are one brave woman! It doesn't even look like the same chair! What a great Tutorial!I hope you stop by StoneGable tonight for TUTORIALS TIPS AND TIDBITS my weekly linky party. Link goes live at 8:00 pm! Your painted chair would be a hit! 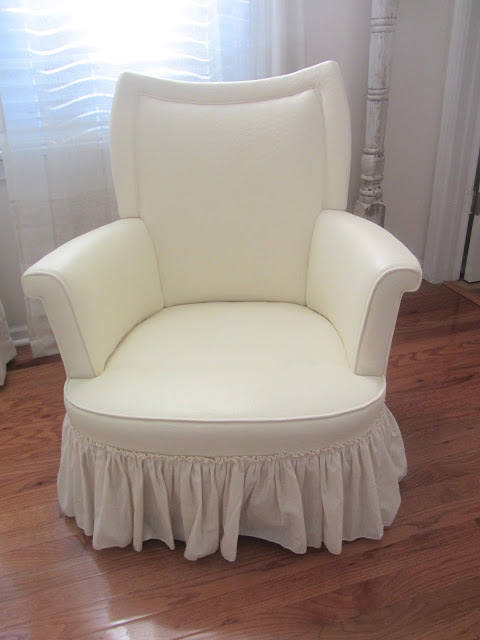 That is one cutie of a chair in her new white paint and ruffles! OMG!!! That is one fabulous made over chair! I cannot believe that is paint! Love the ruffle too. You did a fabulous job!!! Kris, this turned out so great! The ruffled skirt is just darling. I'm not much of a seamstress either, but I'm thinking I do have a couple of pieces I could paint instead of re-cover now! You did it again - you absolutely DID IT AGAIN !!!!!!!!!! I'm in the process of painting a wing back chair - but it's not going to look anywhere near as perfect as this Kris - AMAZING!!! LOVE your new old chair! It turned out fabulous!! I would have never thought of using chalk paint. Thanks for sharing your incredible makeover! Kris, you amaze me! I love the makeover of the chair, you have convinced me to try this. The way you styled it so pretty with the pillows and ruffle, ... STUNNING!!! Hold on a second while I pick my jaw up off the floor......WOW Kris what a beautiful transformation! I knew it would look beautiful! Love the ruffles and your pretty pillows!Yay so glad that chair was still there.See it was meant to be.I bet those people getting rid of it would want it back now..LOL! I just have to tell you Kris, this is absolutely fabulous! I can not believe it is paint. I thought that the paint would make the fabric hard. Good to know that it didn't. You are amazing my friend! Love, love it! Your chair turned out lovely! So much better than the color it was before. I painted one of my chairs a few years ago, but I did not have as good of luck with it as you did. Mine turned out rough, but it was before there was a lot of info online about painting fabric, so I just winged it. As a decorative painting teacher I've been painting fabric for many years, but no one ever seemed to get that it was okay to do so with your soft furnishings. I'm so glad that people are doing so now. The results with you mauve chair are stunning Kris and I particularly like the addition of the chair skirt. What a lovely transformation. Popping back to let you know I am featuring your gorgeous chair at Shabbilicious Friday this week.